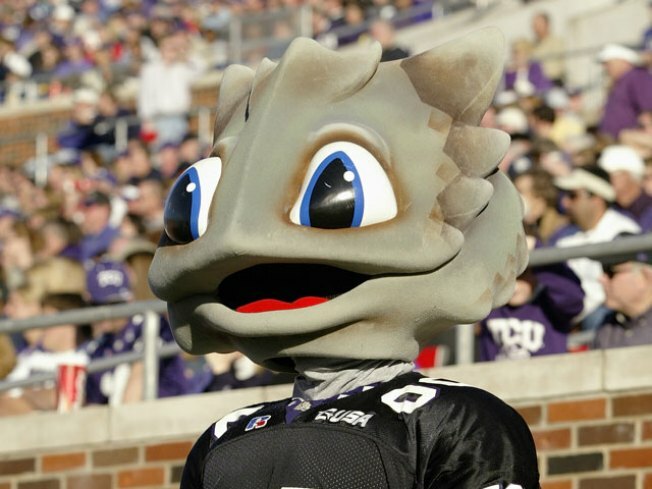 TCU is moving to the Big East Conference, where the Horned Frogs would be BCS busters no more. NBCDFW's Newy Scruggs reported the move on his Facebook page at 9:30 a.m.
Several TCU athletics employees told Scruggs that TCU will move, in all sports, from the Mountain West Conference to the Big East. TCU's board of trustees unanimously approved an invitation Monday to join the Big East Conference in football and all other sports. The move from the Mountain West Conference becomes official July 1, 2012. The Big East will provide TCU automatic access to the Bowl Championship Series and its five big-money games. "Access got easier, not the road," said Frogs coach Gary Patterson, whose third-ranked Frogs (12-0) wrapped up their second consecutive undefeated regular season and Mountain West title with a 66-17 win at New Mexico on Saturday. The Big East currently has eight football teams and one of six automatic BCS slots. "Having BCS automatic-qualifying status was a priority for our football program and a great reward for the success we've had the last decade," TCU athletic director Chris Del Conte said in a statement. TCU is third in the BCS standings, the highest for a non-automatic qualifying team and in line for a chance to play for the national championship if Auburn or Oregon lose next weekend. The Frogs likely will play in the Rose Bowl if Auburn and Oregon both win -- players were holding roses on the field after their win Saturday. "Who would have thought five years ago that the guaranteed fallback position is, you're going to the Rose Bowl, and one loss you're in the national championship?" Del Conte told a room filled with supporters and staff. "We're going to Pasadena, let's get fired up. We're going to the Big East, let's get fired up. ... It's a great time to be a Frog." The pending departure of TCU continues a big shuffle for the Mountain West, which next season is losing Utah to the expanded Pac-12 and BYU, which is going independent in football. Boise State, another big BCS buster, is moving from the WAC to the Mountain West along with Fresno State and Nevada. "Today's intercollegiate athletics environment is very fluid," Mountain West Conference commissioner Craig Thompson said in a statement. "Our board of directors and directors of athletics, as they have throughout the history of the MWC and with even more focus recently, will continue to analyze the landscape and chart our course in the context of ongoing changes." Thompson said there were "conversations already under way with potential future members." Del Conte said losing BYU and Utah was a "significant blow" to the Mountain West. "It was not the same league that we joined," he said. "It's not the same home that we bought, it's not same home we were invited to, and things changed, the landscape changed." TCU could help the MWC land an automatic bid to the BCS after the Frogs are gone. TCU's excellent 2010 (and it's 2011 performance) will count toward the MWC's resume when the conferences are evaluated after the 2011 season. BCS officials have said a non-automatic qualifying conference could earn an automatic bid for the 2012 and '13 seasons. And if the Big East's BCS bid comes under scrutiny when the next TV contract ends after the 2013 season, TCU's 2010 season will also count toward the Big East's resume. "It's too soon to speculate about what the BCS thresholds will be for the 2015 and beyond, but it seems likely that TCU's move will enhance the Big East's position," BCS executive director Bill Hancock said in an e-mail. The Big East has schools in nine of the nation's 35 largest media markets and will soon add Dallas/Fort Worth, the fifth largest. "Located in one of the top five media markets in the country, TCU also enables the Big East to extend its media footprint, which already encompasses more than a quarter of the country," league Commissioner John Marinatto said. The only current Big East team ranked in the AP poll is No. 23 West Virginia (8-3, 4-2 Big East), which is 24th in the BCS standings. Connecticut (7-4, 4-2) could get the league's automatic BCS spot. TCU might not have been headed to a BCS game without Boise State's loss Friday night in overtime at Nevada. Had the Broncos remained undefeated, there was a real possibility that the Broncos could have passed the Frogs in the BCS standings and been the only non-AQ team to get into one of the top-level bowls. "This is a great move," Patterson said. "I'll say this, we don't seem to get bored around this place. ... The one last mark people have held against in recruiting is that we were not an automatic qualifier. Now that's been erased." TCU was a BCS buster for the first time last season, then lost to Boise State in the Fiesta Bowl. The Frogs have won 25 consecutive regular-season games, and 38 of 41 overall. The only losses in that span were in the Fiesta Bowl, and games at Oklahoma and Utah. "Coach Patterson's done a great job there and has brought an awful lot of exposure to themselves just because of the success that they've had," South Florida coach Skip Holtz said. "Probably over the last five years, (they) have been one of the leaders in this whole BCS busters thing, and they've done it on a consistent basis. They've proven that they can compete at that level, that they're deserving of having the opportunity to be in a BCS conference." Louisville athletic director Tom Jurich believes TCU is "a great addition" to the Big East, and has no problem with the league expanding so far west. "Hey, the Big 12's got 10, the Big 10's got 12," Jurich said. "Why should we be any different?" With all TCU sports moving to the Big East, it will create a 17-team basketball league. Marinatto said the league was aware of the logistical issues associated with having 17 basketball teams and nine football teams and that those issues would be addressed soon. He wouldn't discuss the possibility of even more schools being added to the league. Villanova, which won the FCS national championship last season, has been considering moving up in classification in football and joining the league in which their basketball teams and other sports are already a member. "We are excited about the addition of TCU, as they bring a great deal of value to the Big East," Villanova AD Vince Nicastro said Monday. "However, our timeframe has not changed. We are continuing to move forward with our comprehensive evaluation of FBS level football, and are still targeting a decision by the spring of 2011." The Big East will be the fourth conference for TCU since the Southwest Conference broke apart after the 1995 season and the Frogs weren't among the Texas schools that became part of the Big 12. TCU was in the WAC from 1996-2000 before going to Conference USA for four seasons and then joining the Mountain West in 2005. When Nebraska announced it was leaving the Big 12 for the Big 10 and Colorado declared its move to the Pac-10, the Big 12 opted against adding TCU or anybody else and plans to move forward as a 10-team league for now.